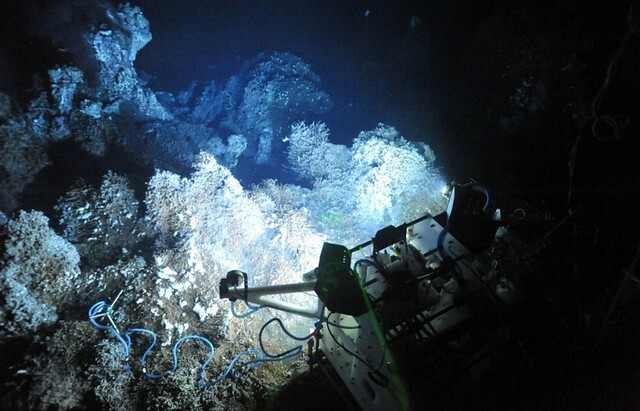 Located on mid-ocean ridges, hot vent ecosystems are characterized by extreme environments and unique organisms, which don't depend on sunlight - a rare feat! Photosynthesis is the way plants convert energy to food, but deep-sea hydrothermal vent communities are sustained by a special group of microorganisms, which carry out a process known as chemosynthesis. This allows the bacteria and archaea to produce organic matter for themselves and the animals using energy from chemical reactions that occur as hot vent fluids mix with seawater. Several studies have shown that the distribution of vent communities and their composition are strongly influenced by local geological, physical and chemical processes. 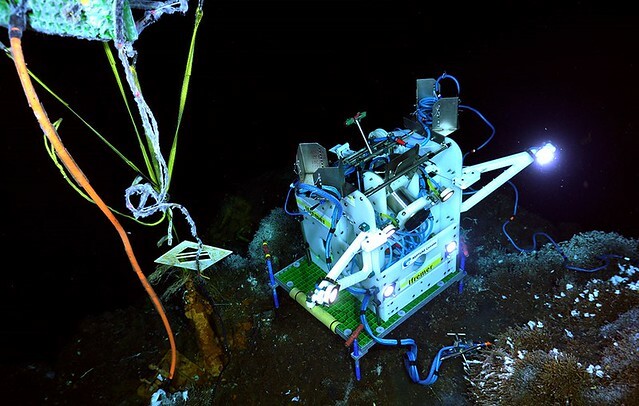 We know very little about the day-to-day life of hydrothermal vent organisms or how these particular ecosystems evolve over time as a result of the various processes affecting them. CHEMINI Fe iron concentration chemical analyzer. To keep Tempo-Mini clean, an efficient and innovative anti-biofouling system protects the camera porthole, lights, and optical oxygen sensor. Tempo-Mini is remotely controlled by researchers in France via the Internet. Software at our Port Alberni shore station acquires the data and keeps all the measurements in order. In 2008, Ifremer collaborated with NEPTUNE and VENUS networks to collect live data from the seafloor in Saanich Inlet near Sidney, BC. After this 5-month test in relatively shallow water (100m), Tempo-Mini was recovered in February 2009. In September 2011, an updated version (Auffret et al., 2010) was connected to the NEPTUNE observatory. Its principal objective is to gather the data needed to describe how physical, geological and chemical variations influence the structure and growth of hydrothermal communities at Endeavour vent field in the northeast Pacific Ocean. Tempo-Mini was deployed to a tubeworm community (Ridgeia piscesae) near the base of Grotto vent edifice. Since 29 September 2011, Tempo-Mini has been sending real-time video of the organisms along with environmental data taken from the area around the animals. This time-lapse video compresses an hour of action in the tubeworm community into 2 minutes. Preliminary results from Tempo-Mini observations suggest that the community is bathed every so often by small amounts of vent fluid. Oxygen values showed a significant decrease in October (from ~90µmol/L to 30-70µmol/L), which has been recovering since the beginning of November (see oxygen plot below). Curiously, this variability in oxygen concentration is not observed in the temperature data measured by the optode. The temperature is relatively low, varying between 2 and 3.5°C. Tempo-mini’s array of 10 temperature probes, which snakes around on the active vent, is showing scientists how much temperatures vary in this environment at small spatial scales. At the base of the vent edifice, temperatures of 2°C were recorded (close to sea water temperature) while temperatures between 10 and 12°C in other locations indicate warming by hydrothermal fluid. In the longer term, multivariate statistics will be used to determine the role of environmental factors on different aspects of the lives of the vent animals (community structure, behaviour, reproduction, colonization, activity rhythms, etc.). CHEMINI, the chemical analyzer, samples seawater daily, and then analyzes the iron concentration. Since the beginning of the deployment, the iron concentrations have remained low and quite stable, between 1 and 5µmol/L, and in concordance with the temperature variability.